The second season of the American web television series The Punisher, which is based on the Marvel Comics character of the same name, revolves around Frank Castle saving a girl from being murdered, forcing him to decide if he should embrace his life as the Punisher. It is set in the Marvel Cinematic Universe (MCU), sharing continuity with the films and other television series of the franchise. The season is produced by Marvel Television in association with ABC Studios and Bohemian Risk Productions, with Steven Lightfoot serving as showrunner. Jon Bernthal stars as Frank Castle, with principal cast members Ben Barnes, Amber Rose Revah, and Jason R. Moore returning from the first season. They are joined by Josh Stewart, Floriana Lima, and Giorgia Whigham. Former series regular Deborah Ann Woll returns in a guest capacity. 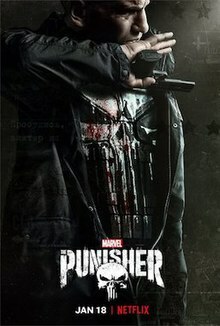 A second season of The Punisher was ordered in December 2017, a month after the first season was released. The new cast members were added in February 2018. Filming began in New York City the next month and wrapped in August. The 13-episode season was released on January 18, 2019. Netflix canceled the series on February 18, 2019. Castle meets a young girl at a bar who insults him. The girl later calls a Russian gangster, requesting a meeting to sell some photos. Unknown to her, the gangster is tied to a chair and being interrogated by a man looking for the photos. After hanging up, he kills the gangster. Castle deals with a belligerent drunk who was hitting on and insulting the bartender, Beth. Afterward, she asks him to grab a drink at her place. The following night, Castle returns to the bar to meet up with Beth, but notices a group of people searching the place while the young girl tries to avoid them. A fight ensues when Castle intervenes, but Beth gets shot. He carries her into a nearby truck and heads for the nearest hospital, taking the girl with him. Castle shoots and kills more members of the group who were following them, reaches the hospital, and Beth survives. Later, Castle and the girl move on. Meanwhile, Dinah Madani visits Billy Russo's hospital room. Shortly after she leaves, he opens his eyes. Castle and the girl check into a motel in Larkville, Ohio and has her treat his wounds. The girl says her name is Rachel and Castle interrogates her about why people are trying to kill her. The gang that attacked them tracks them to their motel. A gunfight ensues in which Castle, Rachel, and one remaining henchwoman survive but all get arrested by local police. Madani visits Russo, who does not remember anything more recent than his time in the Marines. Madani has been visiting Russo almost every day and refuses to believe he has amnesia. Her mentor, Rafi, tries to convince her to stop. That night, she goes home and has a nightmare about Russo right before Castle wakes her up with a call asking for help from the police station. She says no, leaving him to defend the precinct from religious zealots led by a mysterious man on his own. In a flashback, the mysterious man is revealed to be John Pilgrim, a pious man and a former white supremacist with two sons and a sick wife who regularly attends a rural church. The wealthy couple financing the healthcare for his wife, Anderson and Eliza Schultz, tells him that they need him for a mission. In the present, Sheriff Roy Hardin finds that "Rachel" is one of many aliases used by the girl. Pilgrim brings a small army to Larkville County Sheriff Station, who starts firing on the building from the surrounding woods, but Castle gets out of his restraints and kills all of the shooters. Pilgrim manages to sneak up behind the Punisher, but — just as he gets Castle in his sights — Madani shows up with a DHS helicopter to tell Castle that Russo has escaped the hospital. Castle takes Rachel for her protection, and all three leave for New York. Flashbacks show counseling sessions between Russo and psychotherapist Dr. Krista Dumont as he tries to recover his memories and strength amidst nightmares about a skull vest. It's revealed that he grew up in foster care and felt the military was the closest thing he had to a family. In the present, Madani hides Castle and Rachel at her apartment in New York. Castle then visits Curtis Hoyle for information about Russo, but the latter believes their former colleague does have amnesia. Castle recalls Russo telling him about being abused by one of his childhood caretakers, which he relays to Madani and Mahoney, with the former trying to find the abuser while the latter tries to follow her. Rachel breaks down and tells Castle she was part of a group of con-artists from Chicago that had been paid by a Russian gangster to take pictures of a man kissing another man. After the job, the group is massacred while Rachel is out getting dinner for them, forcing her to flee. Meanwhile, Russo tracks down his abuser and kills him. Rachel goes out and discovers Castle's history as the Punisher. When she returns, she reveals her real name is Amy. Russo shows up at Dr. Dumont's apartment asking for help, covered in blood. Frank coerces Turk Barrett to set up a meeting with the Russians who had contracted Amy's group for the photos. At the Russians' gym, they force Turk to set up an ambush for Frank at Turk's apartment. Frank instead goes to the gym and has a deadly confrontation with the remaining Russians while he extracts their leader's name, Nikolai Poloznev, a Russian businessman. Madani attends one of Hoyle's veteran group therapy sessions. Billy befriends one of the troubled veterans at a bar. The Schultzs send Pilgrim to New York, assigning him to go after the Russians. He kills the remaining Russians at the gym. Castle and Amy develop the photos in order to meet Poloznev. Pilgrim tracks down and threatens Madani to turn over Amy and Castle. After capturing Poloznev, Castle interrogates him, wherein the Russian explains that photos were supposed to be used to blackmail Senator David Schultz, a closeted homosexual who had been groomed into power by his parents, the highly religious Anderson and Eliza Schultz. Frank spares Poloznev's life and tells him to leave the country with his wife and daughter, but Pilgrim later finds Poloznev and executes him. Meanwhile, Russo befriends more veterans from Hoyle's therapy group. After violently beating a tow-truck driver for towing one their cars, he convinces them that they are meant for violence and they make plans to rob a bank. Hoyle helps one of the veterans, learning that Russo is meeting with them. Russo returns to Dr. Dumont's and reads his file. He attacks her, causing her to stab him in the hand. He then kisses her and she reciprocates. Russo and Dr. Dumont's relationship becomes sexual. Hoyle, Castle, and Madani track one of the veterans that had been meeting with Russo, with Castle brutally interrogating him. After they find out about the planned robbery, Castle and Hoyle go after Russo while Madani calls Mahoney to let him know about it. Russo and his gang then rob a payday loan business, but Castle confronts him while wearing the skull insignia vest from his nightmares. After Russo freezes upon seeing Castle, who he still believes to be his best friend, his gang grabs him and they attempt to flee. Castle chases them, so Russo leaves his vehicle to confront him while Curtis takes out a sniper going after Castle. Castle reveals he was the one responsible for his facial scars and memory loss. Both Castle and Hoyle hesitate when they get a shot at Russo, which lets him get away. Mahoney chases Castle and catches him, but Hoyle intervenes so he can get away. Russo kills the veterans who disagree with him after they get to the rendezvous before returning to Dr. Dumont, feeling betrayed by Castle. Dumont supports this by implying that Castle is not the man Russo thought he was. He then makes plans to use the veterans to create an army to take on the world. Castle visits his family's graves for guidance after feeling reluctant to kill Russo while he is unaware of his past crimes. Billy's army goes on a successful robbery and murder spree though the city. Anderson visits Pilgrim in order to set a bounty on Castle and Amy, so he contacts mercenaries. Russo breaks into Madani's apartment and confronts her on his forgotten memories, where she reveals that he killed Castle's family in an act of greed. Castle learns Russo's hideout is called Valhalla, but he is confronted by mercenaries after the bounty on his head and he kills them. Now aware of the bounty, Castle tries to contact Amy, only to find her gone. Amy left to try and flee the city by making contact with a friend from her former Chicago gang, who seemingly agrees to help. Amy finally answers Castle's calls and tells him of her plans, but finds out about the bounty on them. Amy's friend betrays her for said bounty and brings mercenaries after her. Castle arrives and kills all but one while Amy hides in a utility closet. The last mercenary is then disarmed by Amy and she shoots him before Castle kills him so that Amy is not the killer. Meanwhile, one of the mercenaries contacts Pilgrim while he's confronted by his former gang. In a vicious fight, Pilgrim defeats his former gang while sustaining several injuries. He then falls back into drugs and alcohol during his recovery, doubting his purpose. Castle and Hoyle scout Valhalla, while Russo spies on them. In flashback, Madani visits Dr. Dumont to discuss Russo and Castle over a bottle of wine. Afterwards, Dumont surmises the only difference between them is Castle's belief that he is better than his victims due to his moral code. In the present, Castle attacks Valhalla, believing the women that attend the gang's parties every night have all left the building. Knowing he was going to attack, Russo sets up an ambush, wherein his gang brutally beats and cuts Castle. After Russo leaves, Castle kills everyone and goes after him. Enraged, he fires blindly into an upper office. Back in the flashback, Dumont tells Russo how to break Castle: destroy his sense of moral superiority over his prey. In the present, Castle enters the office while still chasing Russo and finds three dead women, causing him to freeze in guilt as police arrive. Believing that he killed three prostitutes during his attack on Valhalla, Castle allows himself to be arrested. While he’s under armed guard by the NYPD at a hospital, Karen Page visits him. Amy attempts to free Castle before any hitmen can come after him. After she informs Madani and Karen about what happened at Valhalla, the two women examine the dead prostitutes’ corpses in the hospital's morgue, where they learn that the women were executed at close range by Russo and his men before Castle arrived. Before presenting their findings to Castle, however, the two have to rescue him and Amy from a police officer who was after the bounty. Karen triggers the hospital's fire alarms so that Madani can exfiltrate a disguised Castle. The escape is thwarted by Mahoney, who attempts to transport Castle to a nearby precinct, unaware that Pilgrim is pursuing them. Pilgrim ambushes Mahoney and Castle, pushing their ambulance off a freeway bridge. Before he can finish the job, he's knocked down by Madani's car. While she searches for his body, he steals her car just as Castle saves Mahoney from the ambulance's burning wreckage. Castle obtains the address to Senator Schultz's residence and kidnaps him for interrogation in regards to finding Pilgrim. Meanwhile, Pilgrim discovers the location of Hoyle's trailer from Madani's on-board GPS and briefly interrogates him. Amy arrives at the trailer and Pilgrim knocks out Hoyle while she escapes. He returns to his hotel, unaware that Amy has hidden herself in his car. Realizing that Dr. Dumont is in league with Russo, Madani heads to her residence to confront her, only to push Dumont out of her apartment window in self-defense after the psychotherapist attacks her. After witnessing Dumont's fall, Russo tries to kill Madani in retaliation, but is mortally shot by her and forced to escape when the police arrive. Meanwhile, Amy notifies Castle of Pilgrim's whereabouts, only to be kidnapped by the gunman during the ensuing shootout. Hoyle frees David and turns him over to Mahoney, who decides to not arrest Curtis for his involvement. Pilgrim and Castle engage in a brutal hand-to-hand fight, with the latter coming out on top. After being asked by Pilgrim to spare his sons, Castle uses the gunman to secure a path to the Schultz residence. After a botched underground surgery, Russo takes shelter in Hoyle's workplace basement, where he waits for Curtis to sit with him until he dies. Castle, however, arrives instead and executes him. Later, Castle and Amy confront the Schultzes in their mansion. Eliza tries to kill Amy, but Castle kills the Schultz matriarch instead and gives her husband a gun to use on himself. As the pair leave, Anderson commits suicide. With Russo and the Schultzes dispatched, Castle, Pilgrim and Amy go their separate ways. Dumont is revealed to have survived her fall. Three months later, Castle resumes his duties as the Punisher while Madani works for the C.I.A. A second season of The Punisher was ordered by Netflix in December 2017, less than a month after the first season was released. Showrunner Steve Lightfoot had an idea of what a second season would be when he first knew what the "journey of season 1" was at the start of his work on the series, and did not let the fan reaction to the first season affect his plans since "some people love it, some people hate it, some people are in the middle. My personal opinion with that stuff is you just have to be true to the character and the story you choose to tell." The season consists of 13 episodes. Lightfoot felt the theme for the season was Frank Castle "adopting the mantle" of the Punisher. The season begins with Castle traveling across the United States as a way for him to get "a look at the country he fought for but has never really seen" according to Lightfoot. Costume designer Lorraine Calvert gave Castle a "more relaxed" look while he is traveling, having him wear blue jeans. Castle eventually puts back on another vest with the character's well-known skull symbol, with Lightfoot and Jon Bernthal working to make that "an integral, plot-driven moment" in the season. Bernthal felt they had "figured out a very intelligent, very tactical reason, a very psychologically tactical reason to wear it" with it making "a lot of sense". Lightfoot also spoke to the inclusion of Karen Page in the season, feeling the relationship between her and Castle would continue "to be very important". The makeup department worked to realistically place the scars on Billy Russo's face, who is still recovering from his injuries and is suffering from brain damage. Though Russo resembles the character Jigsaw from the comics, he does not take on that name in the season. Ben Barnes also shaved his head for the role this season and adopts a thicker, rougher, New York accent, "more akin to his Bensonhurst roots". Barnes felt Russo had a vulnerability in the season similar to Vincent D'Onofrio's portrayal of Wilson Fisk in the first season of Daredevil. Dinah Madani has become "fixated" on Russo, visiting at the hospital daily with complete "tunnel-vision on him". Amber Rose Revah added that Madani is "self-medicating" after the events of the first season, resorting to drinking and promiscuous behavior. As Krista Dumont is "[v]ery uptight [and] doesn’t want to let anyone into her personal world", Calvert worked to make her wardrobe equally concealing. Doing this "became a really important part of her character, to hide behind the facade of the clothes that cover her up." Stars returning for the season were confirmed in February 2018, including Jon Bernthal as Frank Castle / Punisher, Ben Barnes as Billy Russo, Amber Rose Revah as Dinah Madani, and Jason R. Moore as Curtis Hoyle. Announced as joining them for the season were Josh Stewart as John Pilgrim, Floriana Lima as Krista Dumont, and Giorgia Whigham as Amy Bendix, with Corbin Bernsen as Anderson Shultz and Annette O'Toole as Eliza Schultz announced in May. Deborah Ann Woll was confirmed to be reprising her role as Karen Page in December 2018. Filming for the season had begun by March 10, 2018, in The Bellmores, New York. Filming occurred in Albany, New York, in mid-July 2018, with production on the season wrapping in August 2018. The second season of The Punisher was released on January 18, 2019 on the streaming service Netflix, worldwide. By mid-June 2018, discussions were underway regarding the season being promoted at San Diego Comic-Con that year. Bernthal was already set to be at the convention to promote his role in the ninth season of The Walking Dead. A teaser for the season was included in Netflix's announcement of titles coming to the service in January 2019, and announcing the season was "coming soon". The review aggregator website Rotten Tomatoes reported a 52% approval rating with an average rating of 6.53/10 based on 23 reviews. The site's critical consensus reads, "The Punisher's second season leaves fans torn between the undeniably action-packed fun and the underwhelming portrayal of the charismatic Frank Castle." Metacritic, which uses a weighted average, assigned a score of 58 out of 100, based on 6 critics, indicating "mixed or average reviews". ↑ Patten, Dominic (February 18, 2019). "'The Punisher' & 'Jessica Jones' Canceled By Netflix; Latter's 3rd Season Still To Air". Deadline Hollywood. Archived from the original on February 18, 2019. Retrieved February 18, 2019. 1 2 3 4 5 6 7 8 9 Andreeva, Nellie; Petski, Denise (February 26, 2018). "'Marvel's The Punisher': Josh Stewart, Floriana Lima & Giorgia Whigham Join Cast of Netflix Series For Season 2". Deadline Hollywood. Archived from the original on February 26, 2018. Retrieved February 26, 2018. 1 2 3 Ramos, Dino-Ray (May 10, 2018). "Corbin Bernsen And Annette O'Toole Join Marvel's 'The Punisher' At Netflix". Deadline Hollywood. Archived from the original on May 10, 2018. Retrieved May 10, 2018. 1 2 3 4 Mancuso, Vinnie (December 28, 2018). "'The Punisher': 30 Plot Details, New Characters, & Backstage Facts To Know About Season 2". Collider. Archived from the original on December 31, 2018. Retrieved December 31, 2018. ↑ Andreeva, Nellie (December 12, 2017). "'The Punisher' Renewed For Season 2 By Netflix". Deadline Hollywood. Archived from the original on December 13, 2017. Retrieved December 12, 2017. ↑ Chitwood, Adam (July 4, 2018). "'The Punisher' Showrunner Steve Lightfoot on Season 2, If He'd Rather Do 10 Episodes, and More". Collider. Archived from the original on July 5, 2018. Retrieved July 6, 2018. ↑ Goldman, Eric (December 12, 2018). "'Marvel's The Punisher' Season 2 Premieres in January". Marvel.com. Archived from the original on December 15, 2018. Retrieved December 16, 2018. ↑ Lovett, Jamie (March 10, 2018). "'The Punisher' Season 2 Has Started Filming, First Photos Surface". ComicBook.com. Archived from the original on March 12, 2018. Retrieved March 12, 2018. ↑ "Actor confirms Albany trip to shoot Netflix show". WNYT. July 17, 2018. Archived from the original on July 18, 2018. Retrieved July 18, 2018. ↑ Dominguez, Noah (August 12, 2018). "Marvel's Punisher Wraps Filming On Second Season". Comic Book Resources. Archived from the original on August 22, 2018. Retrieved August 22, 2018. ↑ Boucher, Geoff (January 3, 2018). "Marvel's 'The Punisher': Netflix Drops Season 2 Trailer And Release Date". Deadline Hollywood. Archived from the original on January 3, 2019. Retrieved January 3, 2018. ↑ D'Alessandro, Anthony; Patten, Dominic (June 18, 2018). "Marvel's 'Iron Fist' Set To Hit Comic-Con; No Show For 'Captain Marvel' & Film Side". Deadline Hollywood. Archived from the original on June 19, 2018. Retrieved June 19, 2018. ↑ Whitbrook, James (December 12, 2018). "Here's Your First Tiny Little Tease for The Punisher Season 2". io9. Archived from the original on December 12, 2018. Retrieved December 12, 2018. ↑ "Marvel's The Punisher: Season 2 (2019)". Rotten Tomatoes. Retrieved January 30, 2019. ↑ "Marvel's The Punisher : Season 2". Metacritic. Retrieved January 23, 2019. Created by Gerry Conway, Ross Andru and John Romita Sr. in "The Punisher Strikes Twice!"